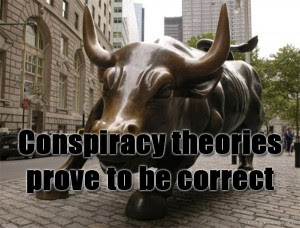 Dan Majestic writes from New York about all the scams of the rich, the conspiracy theories and the recent financial crash. He openly criticises through another ‘let’s be cynical’ rant about the eight things they don’t want you to know about. He looks at the financial situation of the world and marries this with the legal scams that are biting into the world economy. Most people when they here the words ‘conspiracy theories’ they switch of or they brush they topic under the conspiracy theory carpet, this is not one of those chores. If you have ever wondered why the rich are rich and are curious about why you cannot pay your bills, then go over to Stirring Trouble Internationally. Knowing the loop holes will not help you get out of debt, but listening to the rants from Dan Majestic might make you feel better. Take what he says and use it in conversation, impress your friends with this inside information. Whilst your laughing your learning. Looking at some of the conspiracy theories about the money men. And concluding that most of them have proven to be correct.